Cet article est le fruit d’une pratique collaborative dont le but est de mettre en lumière la façon dont Barbara Hepworth rend compte de gestes dans ses sculptures. Le projet regroupe cet article universitaire et un certain nombre de poèmes multimédia numériques qui en sont partie intégrante. Les poèmes ont été créés par les auteurs en réponse aux sculptures de Barbara Hepworth au Barbara Hepworth Museum (St Ives) et Hepworth Wakefield (Yorkshire). L’aspect créateur de l’entreprise a consisté dans une tentative de transfert du geste des arts plastiques à la pratique textuelle multimédia. Nous fondant sur une compréhension globale du geste et les idées formulées par Hepworth elle-même – sa notion de « geste dans le paysage » - nous prenons en compte les gestes de l’artiste, les gestes représentés dans les sculptures, et les gestes induits par l’œuvre (avec la question du spectateur et du lecteur participant). Le texte est destiné à provoquer, par l’emploi d’oeuvres interactives, la réflexion sur les liens entre tension et geste en sculpture et dans les textes numériques, plutôt qu’à cataloguer les gestes chez Hepworth dans le but d’en faire une typologie exhaustive. 1This is a collaborative practice-based investigation which aims to outline some of the key lessons and implications from a number of the uses of gesture in the sculpture of Barbara Hepworth. This mini-research project consists of this formal academic paper and a selection of digital multimedia poetry which functions as a creative-critical intervention and a component part of this paper.1 The digital multimedia poetry was created in collaboration by the authors in response to Hepworth’s original sculpture at the Barbara Hepworth Museum (St Ives) and the Hepworth Wakefield (Yorkshire). The creative element of the investigation attempts to model Hepworth’s use of gesture and in doing so translate the function of gesture from its use in a visual arts practice to a multimedia textual practice. Building on a multi-disciplinary understanding of gesture and Hepworth’s own ideas about “gesture in landscape” (53), the project combines the historical and cultural implications of gesture in 20th-century sculpture with technical reflections drawn from and encoded in the practice collaboration. This project considers the gestures of the artist, gestures represented in the artwork, and gestures choreographed by the artwork (in the reader/audience/participant). The collaboration features new interactive works created specifically for the Interfaces 2017 conference where this paper was originally presented alongside some of the creative practice. The project is intended to function as a provocation raising questions about the interaction between tension and gesture in both sculptural and digital textual practices, rather than an authoritative, exhaustive or conclusive typology of the use of gesture in Hepworth’s corpus (Figure 1). 2This research project involves attempting to translate “gesture” as an art function across two very different art practices, cultures and media-forms. It draws on Hepworth’s 20th-century sculpture (which is material, visual and tactile) and applies some of the approaches used to a 21st-century multi-media collaborative digital poetry practice (which is for example visual, virtual, durational, kinetic, textual and which invokes the human voice). Because of the range of practices and discourses we are trying to resolve we have opted for a wide-angle definition of “gesture” which tries to accommodate all of its specific applications in the disciplines we’re bringing together and translating between. 3The application of “gesture” in choreographic practice and performance arts would typically include not just the shape itself but the formation of the shape. Consider for instance this elucidation from Susanne Langer’s landmark Feeling and Form: “Gesture is a vital movement; to the one who performs it, it is known very precisely as a kinetic experience [...]. The primary illusion of dance is a virtual realm of power – not actual, physically exerted power, but appearances of influence and agency created by virtual gesture” (174-5). This definition of gesture in practice, which incorporates the movement of formation of shape, is perhaps the closest to the dictionary definition of gesture.2 However, in the case of Hepworth’s sculpture for example, it is not possible to have a direct experience of formation of shape as we are not witness to that action. Rather in sculpture, as is the case in photography and other static visual arts, the action of formation of the shape is one of the implied actions of the shape, and secondary to it. 4 See for example “St Ia”, “Five Syllabic Peaks” and “Strong and Stable”. 6The next portion of the paper outlines and defines three uses of gesture (as defined above) which we have identified in Hepworth’s sculpture: gestures of tension, gestures of formation and gestures of invitation. This is not intended to be an exhaustive survey of the uses of gesture in Hepworth but rather an achievable starting point in drawing out a first typology of gesture which might be useful to contemporary arts practices. 7If gesture is a shape which implies action, gestures of tension are those shapes whose implied action takes place in the future; gestures of tension suggest that something is “about to happen” and express imminence, and this is analogous to the way the term “tension” is used in narrative studies (e.g. consider the drawing back of a shower curtain in a horror film). In narratology, tension (or anticipation of the falling action) intensifies with the rising action and comes to a maximum point at the climax, defined by Prince as “the point of greatest tension; the culminating point in a progressive intensification” (1958). In physics, tension is a force and a type of potential energy stored within matter: here too a future action or movement is implied. 8The tension of physics is heavily implied in Hepworth’s work, particularly in the pieces which have the feeling of being held together by taut cables, as in Wave (1943-1944) and Orpheus Machetes (1956) (Figures 2-3); here the overwhelming sensation is the imminent flinging apart of the sculpture, should the delicate balance be unsettled or any of the cables snap – the shape gestures its explosion. 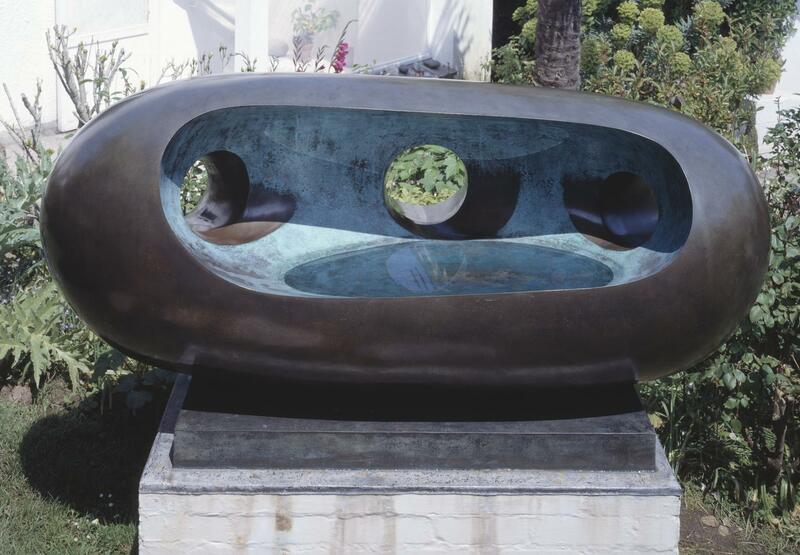 9On the other hand, some of Hepworth’s work implies a future action of implosion or collapse. In particular this is evident in the precarious stacks such as those seen in The Family of Man (1970) (Figure 4). These pieces, reminiscent of stone stacks in both Hepworth’s childhood home in the West Riding and those of West Penwith (the Cornish landscape of her adult life), evoke the sensation that they could topple over at any moment, that they are a nudge away from collapse. 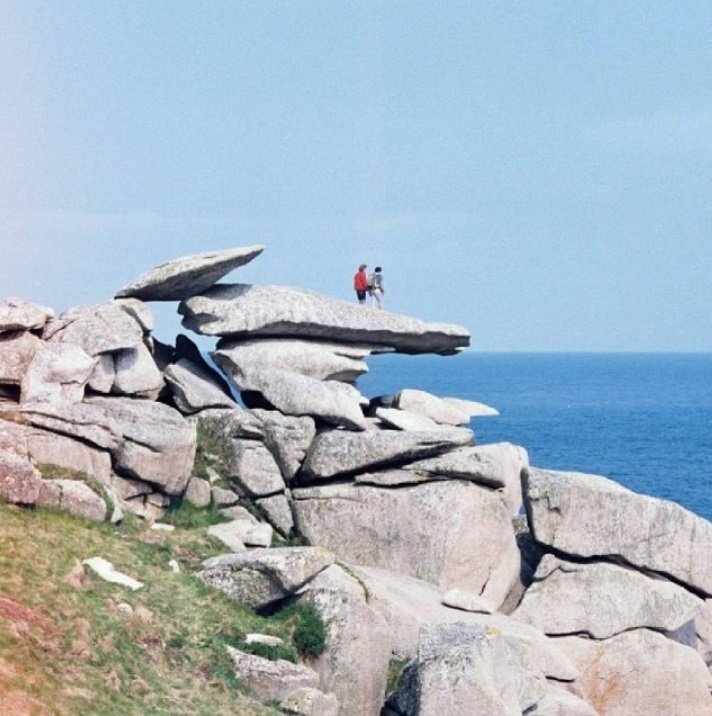 Dotted along the coastline of West Penwith are a number of “logan stones” – colossal stones which can be substantially rocked in their precarious positions by even the slightest human force. 10Implosion too is an implied future action, another “about to happen” that can be read in some of Hepworth’s pieces. As well as the wave forms we might also think about geological implosion, in particular the pieces Rock Form (Porthcurno) (1964) and Pendour (1947), which bear a strong resemblance to the sea-cave voids on their eponymous beaches (Figures 5-6). The continual attrition of water creates increasingly large voids in the rock sea-caves of the Cornish coast, leaving them prone to collapse down and inwards. Rather than inherent in matter, this tension is one of gravitational potential energy. 12While the gesture of tension implies a future action, much of Hepworth’s work also evokes the action of its formation – action that has already taken place. This gesture towards past action is not unusual in choreography and performing arts (consider for instance the clown drawing a tear on his face, expressing that he has been made sad by the previous event), but it is especially pertinent to static art forms where gesture is the gateway to the experience of formation. 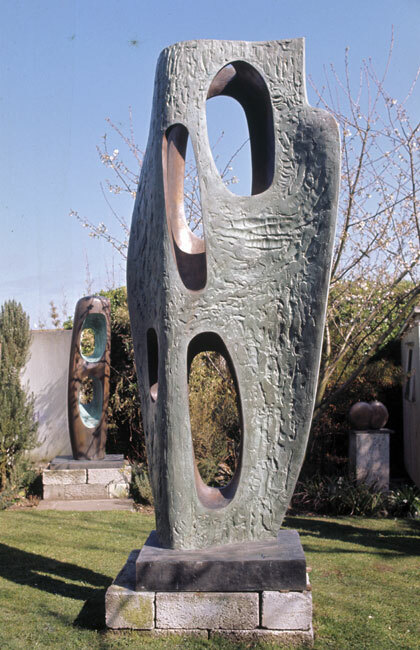 Put simply, much of Hepworth’s work invites the viewer to ask how a shape was formed, and what the action of that formation was. 13Aside from the literal sculpting work and craftsmanship involved, some works imply alternative conceptual formations. Indeed the gesture of formation of an artwork creates a dynamic tension between the gesture of the artist and the virtual formation of that being represented. In those previously discussed works which enact gesture in landscape (drawing upon waves, natural rock forms, and sea caves) the repeated actions of nature are inscribed within the form. Some of these gestures are millions of years old and refer to the attrition of massive natural forces. In drawing upon the landscape of West Penwith, Hepworth’s holes and pierced forms inherit the past actions of wind, water, ice and tidal erosion. 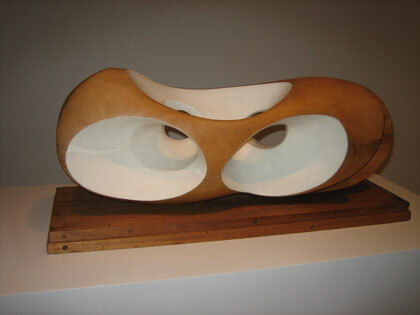 14In addition to formation by natural forces, some of Hepworth’s work seems to imply formation actions of design or agency. Drawing upon landscape again, many of the rock formations in both the West Riding of Yorkshire and West Penwith look to have been “placed there”, and indeed there are many parallel mythologies which attempt to explain the unusual geology of both locations. While Cornwall’s Cow and Calf rocks were thrown into place by a giant demonstrating his strength, Yorkshire’s Cow and Calf was created in the misstep of a giant fleeing his wife. And in both of these landscapes many of the notable rock formations actually were placed there; both are important sites of neolithic and bronze age activity with standing stones, circles, cup and ring marks, quoits, dolmens and cairns. Hepworth’s stacked work exemplifies this gesture of formation, as do many of the form-in-landscape works, but there is also an agency implied in the formation of the cable-based works which are after all solid and secure, many of which are carved out of wood and the cables added afterwards. Despite the actual integrity of the structure and formation story these works still look as though they have been twisted together by some extreme unknowable force. 15A third use of gesture in Hepworth’s work is the gesture of invitation. In this gesture the shape invites the viewer of the work to act. How does the shape invite us to behave and interact with it? How does it choreograph movement? 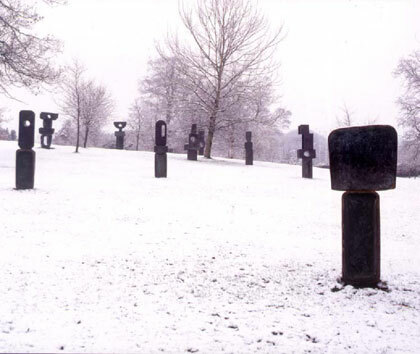 This is particularly evident when experiencing Hepworth’s work in the outdoors, where there can be free movement of people and nature around the sculpture. At Hepworth’s garden in St Ives for instance, birds bathe in the pool of rainwater that collects in River Form (1965) and visitors stoop and stretch to peer through holes at different angles (Figure 7). At the Yorkshire Sculpture Park children can scarcely be prevented from touching The Family of Man (1970). 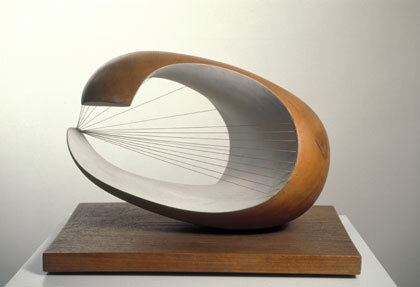 Whether enacted or not Hepworth’s work invites us to look through, move around, touch, insert, topple and rock. 17The selection of practice presented alongside this paper is designed specifically for this mini-research project and is intended as a piece of practice-as-research which primarily speaks for itself. It features eighteen digital poems created collaboratively which attempt to implement the three different uses of gesture in Hepworth’s work identified above. Put simply digital poetry is poetic practice which necessarily involves the use of computational devices or digital media, and it is a subset of electronic literature, which refers to “works with important literary aspects that take advantage of the capabilities and contexts provided by the stand-alone or networked computer” (ELO).5 This medium for poetry affords great potential for creating virtual poetry environments which a reader can navigate and interact with and there is a rich tradition of works which take advantage of that potential (consider for instance “Poemas no meio do caminho” by Rui Torres). The digital poems in this portfolio all involve a visual component and the construction of virtual spaces, hence the starting point is an affinity with sculpture. 20The “Static” poems most closely resemble traditional page-based poetry. Here the primary focus is on shape rather than a literal or implied movement. The first four poems are image-based and use projective verse, open form and visual techniques to create gestural textual environments; this is particularly apparent in the precarious forms in “Zennor Carn” and “Lanson” and the unstable three-line stanza in “Lankidden”. The poems “Men an Tol” and “St Ia” move shape, still static, into three-dimensional space, using the WebGL environment within P5.JS and .obj 3D models. 21The “Complex” poems are animated 3D prototypes to be translated in due course into high resolution interactive virtual environments. These poems attempt to bring together some of the ideas and functions from the “Kinetic” and “Static” works, and most attempt to implement one or more of the gesture functions identified in Hepworth’s work. The poem “Five Syllabic Peaks” for instance draws out the vowel as a principle building block of language, inviting the reader to vocalise. The poem “Doomsdale” represents a number of histories of Launceston Castle in North Cornwall. The motte and bailey arrangement is preposterously steep and creates a sense of dread, tension and curiosity which formed the inspiration for the poem. Most of the “Complex” pieces also have their own introductions which go some way to introducing their relationship with gesture. In general the poems are intended to invite readers to enter and disrupt virtual spaces, while simultaneously choreographing their real world movements through interface devices; they re-present gestures of material formation from sculpture, architecture and organic geological processes which often sit in tension with the artistic gestures involved in constructing virtual reproductions; and they are directly inspired by architectural and geological gestures of tension, especially rocking, falling, implosion and explosion. 22In the course of the research for this project, which saw us draw upon our existing personal relationships with the relevant landscapes and each other’s practice (in addition to the usual book-based research and museum visits), we have made inroads into both emergent digital poetry practice methods and our understanding of the function of gesture in Hepworth’s sculpture. There is room for development in both the practice work and in sketching out a fuller typology of gesture as it functions in Hepworth’s work. Yet we have begun with an identification of gestures of tension, formation and invitation, and these functions have proved a useful starting point for new collaborative practice. COLLINS, W. Wilkie, Rambles Beyond Railways: or, Notes in Cornwall Taken A-Foot. London: Richard Bentley, 1861. ELO [Electronic Literature Collection]. “What is Electronic Literature”. About the ELO. URL: https://eliterature.org/about/ (page accessed 10th May 2018). HATTEN, Robert S. “A Theory of Musical Gesture and its Application to Beethoven and Schubert”. Music and Gesture. Eds. Anthony Gritten and Elaine King. Aldershot: Ashgate, 2006. 1-23. 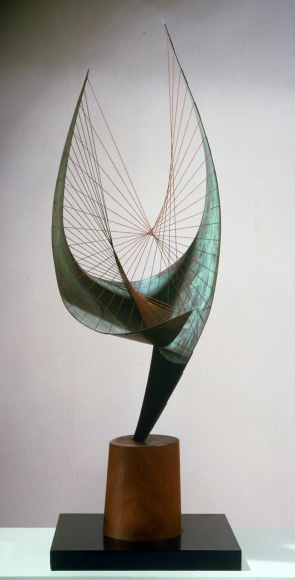 HEPWORTH, Barbara. A Pictorial Autobiography. Bath: Allert de Lange, 1958. LANGER, Susanne. Feeling and Form. New York: Charles Scribner’s Sons, 1953. OXFORD ENGLISH DICTIONARY. “gesture, n.”. OED Online. Oxford: Oxford University Press, 2017. http://www.oed.com/ (page accessed 10th May 2018). PRINCE, Gerald. A Dictionary of Narratology. London: University of Nebraska Press, 2003. TORRES, Rui. “Poemas no meio do caminho”. The Electronic Literature Collection Vol. 2. URL: http://collection.eliterature.org/2/works/torres_poemas_caminho.html (page accessed 10th May 2018). 1 This paper consists of 50% traditional essay and 50% equivalent practice-as-research. The URL to access the practice is: www.newfiretreepress.co.uk/gesture (page accessed 14th May 2018). 2 Taken from the Oxford English Dictionary for instance: “A movement of the body or any part of it. Now only in restricted sense: a movement expressive of thought or feeling”. 3 “Gesture” comes from the Latin “gerere” meaning to carry, reflecting the original use of the word for posture (also taken from the Oxford English Dictionary as above). 5 See Leonardo Flores’ definition from iloveepoetry.com, and the ELO’s canonical portfolio “The Electronic Literature Collection” hosted at collection.eliterature.org (pages accessed 14th May 2018).